The College’s overall A Level pass rate was 98% at grades A* – E. One of the College’s top achievers was Timothy Harding from Pinner who gained grades A*AAB and has secured a place at Brasenose College, Oxford to read Physics. Other high achievers have gained places at some of the top universities including Warwick and Bath to study diverse subjects from Veterinary Science to Civil Engineering. Timothy had taken time out from education to work in various jobs including a shop assistant and lifeguard before studying for his A Levels at Uxbridge College. 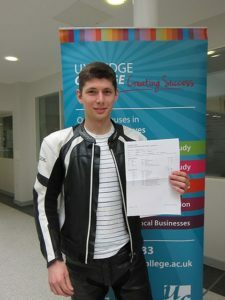 Amanda Washbrook, Head of the Academy at Uxbridge College, which teaches A Levels, GCSEs and Vocational Science, said: “I would like to say a huge congratulations to Timothy and all our other A Level achievers this year. We have seen some really excellent individual performances,Timothy Harding both in terms of high grades and distance travelled.